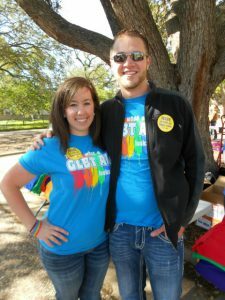 Allies participates in numerous on and off campus events such as GLBT Awareness Week and Coming Out Week. Allies also presents regular Ally Workshop during Fall and Spring semesters. If you are a member, please join the Aggie Allies Facebook group for more information about upcoming events. October 11, 2018, 6:00 – 8:00 p.m.
September 25, 2018, 5:30 – 7:30 p.m.
Each fall, students, staff and faculty have a chance to attend the fair to check out various departments, student organizations, and B/CS groups committed to the GLBT community, and learn more about the GLBT Resource Center. Hands Across Aggieland was an event where we marched across campus to show our pride. We gather with rainbow flags, supporting signs and t-shirts and we chant for equality and love. 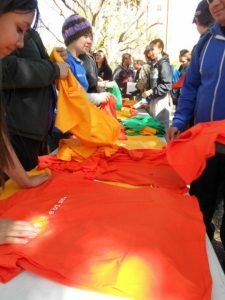 Aggie Allies raised more than $7,000 this year to give out 1000+ t-shirts to the campus community! Supporters had the option to choose one of the following taglines: gay? fine by me., bisexual? fine by me., lesbian? fine by me., transgender? fine by me., or queer? fine by me.